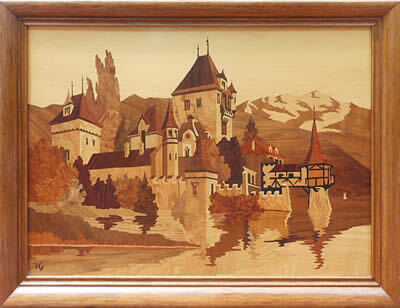 Our August update features a superb example of the ever popular Oberhofen Castle picture by the Buchschmid and Gretaux Wood Inlay Company..
Our August update features the wonderfully picturesque view of Oberhofen Castle by the Buchschmid and Gretaux wood inlay company which is currently owned by Nancy Kalnins. We have written about this beautiful design several times before. Indeed, if you check through our Can We Help? pages you will find quite a few examples of this design. Buchschmid and Gretaux did produce different sized versions of this picture - this one owned by nancy is the 24.5 inch width example of the design. 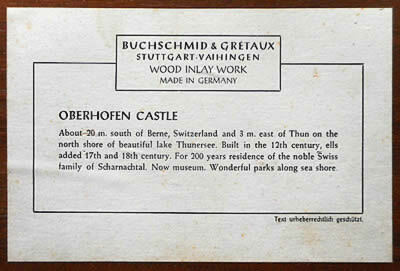 Reluctantly Nancy is forced to offer her B&G Oberhofen Castle picture for sale. We can see no signs of distress in this picture, it looks to be a very clean example. Quite often direct sunlight, central heating and a hundred and one external influences can have a detrimental effect on wood inlay pieces and pictures, but Nancy's picture appears to us to have escaped such unfortunate episodes. Which means that it has been well looked after. We (the Marquetry Society) do not, and will not, act as brokers, intermediaries or sellers for, or on behalf, of any of our contributors. We will however, and purely as a goodwill gesture, forward your enquiry onto the owner of the piece in question so that you and the owner can conduct any sales or transactions personally and between yourselves. Our strict policy is that we do not become involved in any transactions other than our own which have previously been verified and agreed by our executive committee at a meeting set up for that purpose. The forwarding of your enquiry will be done strictly as a goodwill gesture and for no other purpose. Click the above button to return to page 64 of "Can You Help"